SpaceX plans to launch its Falcon Heavy rocket – the biggest in the company’s history – for the first time on Tuesday. The company’s founder, Elon Musk, is putting his Tesla Roadster on top as a test payload. 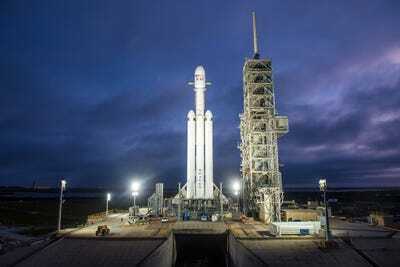 CAPE CANAVERAL, Florida – SpaceX this week is preparing to launch Falcon Heavy, the biggest rocket in the company’s history, for the first time. SpaceX’s founder, Elon Musk, wanted this test launch to happen as early as 2013, though he recently said it could end in an explosion. 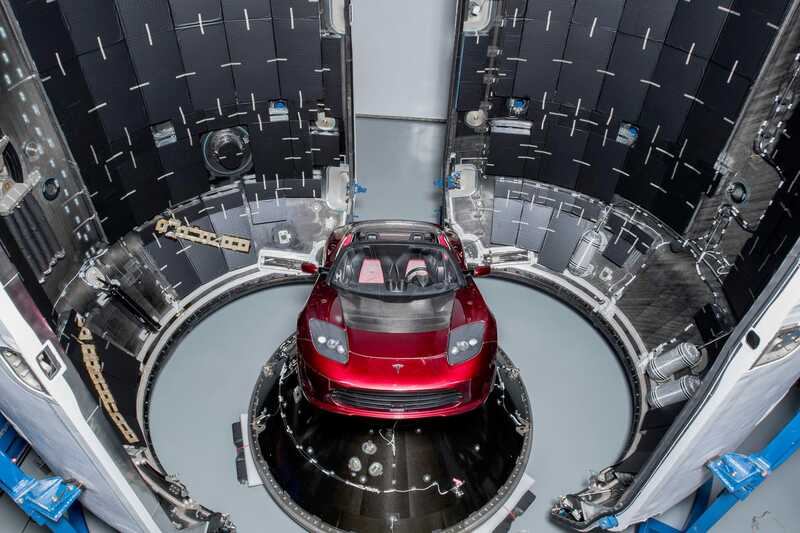 Instead of putting a standard “mass simulator” or dummy payload atop Falcon Heavy, Musk – who once launched a wheel of cheese into orbit – will put his personal 2008 midnight-cherry-red Tesla Roadster on top of the monster rocket. In an Instagram post over the weekend, Musk also revealed that the car would carry a dummy driver, which Musk is calling “Starman,” wearing a SpaceX space suit. However, all rocket payloads need a permit from the Federal Aviation Administration to launch, and Musk’s sleek electric car is no exception. The FAA granted SpaceX that permission on Friday in a staunchly formal notice, which Keith Cowing posted on NASA Watch. “Space Exploration Technologies is authorised to conduct … a flight of the Falcon Heavy launch vehicle from Launch Complex 39A at Kennedy Space Center (KSC) transporting the modified Tesla Roadster (mass simulator) to a hyperbolic orbit,” the FAA permit said. SpaceX/Flickr (public domain)SpaceX’s first Falcon Heavy rocket at launchpad 39A at NASA’s Kennedy Space Center on December 28. Launch Complex 39A is the same launchpad onto which NASA wheeled Saturn V rockets – used to fly Apollo astronauts to the moon – in the 1960s and 1970s. Musk hopes to continue that tradition of space exploration with future Falcon Heavy launches, including a private lunar voyage for two as-yet-unnamed citizens. “The payload will be … playing Space Oddity, on a billion year elliptic Mars orbit,” Musk said in December. While Musk has said the car is “one of the silliest things” he ever imagined launching, its 2-ton mass and ambitious orbit is no joke, as Eric Berger points out in a recent story for Ars Technica. “No company has ever launched a private payload beyond geostationary orbit before,” Berger said, referring to an orbit roughly 22,500 miles above Earth. The Hohmann transfer orbit “is critical to understanding how Musk plans to sell the rocket and what its flight, after all these years of waiting, means for the aerospace industry,” Berger wrote. If Falcon Heavy doesn’t blow up, immortalizing Musk’s on- and off-Earth legacies, SpaceX will move forward with launches for paying customers, including the US military, perhaps later this year, the company says. More people would be likely to line up to place payloads atop a Falcon Heavy rocket. While it costs about $US90 million per launch, that’s roughly a third of the cost of any similarly powerful rocket built by SpaceX’s competitors. Part of what makes that price possible is that the booster cores – each of which each has nine Merlin engines and stands about 134 feet tall – are fully reusable. With enough fuel and the right trajectory, Falcon Heavy has enough thrust to launch a payload heavier than a car to Pluto, let alone Mars. That would appeal to NASA, which is gearing up to launch several planet- and moon-bound spacecraft in the coming years. The space agency is also in an ever-present budget pinch – and behind schedule in building its super-heavy-lift rocket, called Space Launch System.